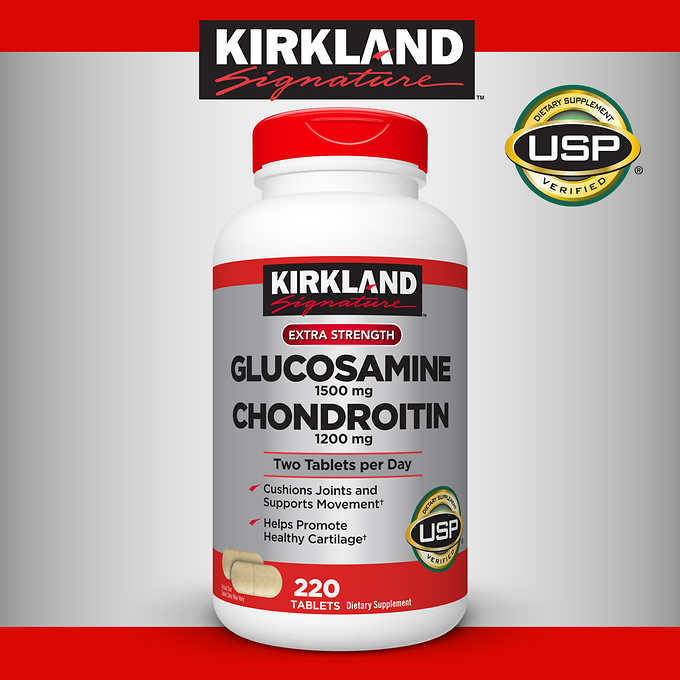 Kirkland Extra Strgth Glucosamine HCI 1500mg/Chondroitin Sulfate 1200mg 220Tbs SALE! Take two tablets daily with a full glass of water. Calories - 10, Total Carbohydrates - <2.5 g - <1%**, Sodium - 108 mg - 5%**, Glucosamine HCI 1.5 g (1500 mg) - ***, Chondroitin Sulfate Sodium (Bovine) - 1.2 g (1200 mg) - ***. Glucosamine Hydrochloride (from Shellfish: Crab, Shrimp, Crayfish), Chondroitin Sulfate Sodium (Bovine), Croscarmellose Sodium, Microcrystalline Cellulose, Silicon Dioxide, Magnesium Stearate, Stearic Acid, Sodium Lauryl Sulfate, Hypromellose, Artificial Vanilla Flavor, Polyethylene Glycol, and Carnauba Wax. ††The most recent evidence of the benefits of this formula come a landmark NIH-sponsored study.